The hotly-anticipated details of Expo 2020 Dubai’s legacy development have been unveiled promising residents and visitors to the city a brand new urban experience. Revealed to the public at the Cityscape Global 2017 real estate event, which took place in Dubai last week, the world-class district will be an integral part of the legacy of Expo 2020 Dubai from Q4, 2021, and support the emirate’s long-term economic development. It will become a vital hub for innovators, original thinkers and pioneers, creating jobs and attracting investment, according to Dubai Expo 2020 Bureau. The district will include 65,000 square metres of residential space and 135,000 square metres of commercial space in a location that will be home to world-class innovation, educational, cultural and entertainment facilities, as well as a conference and exhibition centre. It is designed to facilitate modern ways of living, blending work and recreation in an ecosystem that fosters closer connections – physically and digitally. Her Excellency, Reem Al Hashimy, UAE Minister of State for International Cooperation, director general of Dubai Expo 2020 Bureau, explains: “Back in 2013 when we won the bid to host this great event, we set ourselves two clear objectives in line with our leaders’ vision: to stage a World Expo that would amaze the world and build a lasting legacy with a global destination that offers a new alternative for urban living. “His Highness Sheikh Mohammed Bin Rashid Al Maktoum (Vice-President and Prime Minister of the UAE and the Ruler of Dubai) instructed us to build a site for a permanent legacy and therefore we had to think of ways to capitalise on what was being built for Expo as well as for post-Expo. District 2020 has been designed to be environmentally progressive and sustainable, reflecting the changing demands of the modern world. Every building will meet or exceed the rigorous LEED Gold standards in sustainable construction. It will be home to iconic structures such as Al Wasl Plaza, the Sustainability Pavilion, which will live on as a Children and Science Centre, and the falcon-shaped UAE Pavilion. They have been designed by some of the world’s most renowned architects. “District 2020 will continue to carry forward Expo 2020’s mission of connecting people – offering a new urban experience,” says Marjan Faraidooni, senior vice president of Legacy Impact and Development at Expo 2020 Dubai. “It will be at the cutting edge of modern working and living – combining places to work, rest and explore to create an ecosystem that stimulates connections, inspires creation and drives innovation, creating value for all those who come here. The conference and exhibition centre is also being developed by Dubai World Trade Centre to build on Dubai’s reputation as the Middle East’s premier destination for major events, conferences and exhibitions. District 2020 will benefit from the thousands of connections being made as visitors from around the region – and the world – come together to share ideas and create opportunities during and after Expo. Design: The district will foster a perfect work-life balance in an integrated and walkable community, connecting entertainment and lifestyle offerings, such as the Al Wasl Plaza and UAE National Pavilion, with flexible and modern office buildings. The district will utilise the latest strategies, materials and innovations to maximise water efficiency and minimise energy use. All buildings will be LEED Gold Certified as a minimum standard. Business: District 2020 will be an innovation hub for those with the urge to connect with others and live at the centre of human innovation. It will be a contributor for the UAE economy, attracting investment and exceptional talent to an ecosystem designed to connect people, goods and ideas, and facilitate access to markets, knowledge and innovation. It will be a place for those who want to operate in a dynamic, collaborative environment, where companies in big data, the internet of things and augmented reality, can easily connect. It’s for the start-up, the SME and the multinational. Community: District 2020 will be at the heart of Dubai South, an emerging master-planned city. 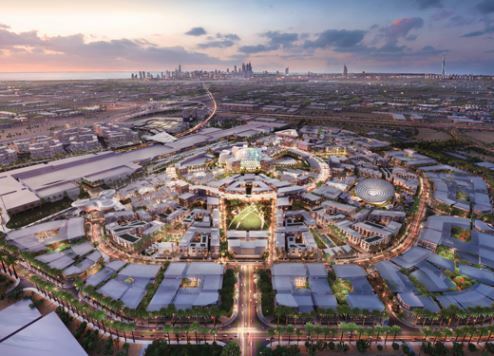 The district includes 65,000 square metres of residential space, Al Wasl Plaza as the central gathering point, 10km of cycling track and 45,900 square metres of parkland – the equivalent to six football pitches. It will be a home, workplace and retreat. Technology: District 2020’s digital infrastructure will deploy a high-speed, resilient network utilising the latest available technologies to provide high performance plus scalability, flexibility and security. It will boast one of the first 5G mobile networks in the world. Education: District 2020 will also be home to world-class education, academic and research facilities, a Children and Science Centre, museums and galleries, to support business and empower the young. Transport: District 2020 will be one stop from Al Maktoum International (DWC) – set to become the world’s largest airport – on the dedicated Route 2020 Dubai Metro line that is currently under construction. It is also adjacent to four major cross-country motorways and close to Jebel Ali Port, the largest marine terminal in the Middle East. The World: The UAE sits at the crossroads of the world, geographically and culturally. Two-thirds of the global population are no more than an eight-hour flight from the country. It is estimated that 20 million people will visit Dubai each year by 2020 and 25 million visits are expected at Expo 2020 Dubai between October 2020 and April 2021 – 70 percent of which will be from outside the host nation, the largest percentage in World Expo history.